I made this risotto a few weeks ago and just now found the picture. It is not as quick as my usual dinners, and definitely not one to do with a toddler on your hip, but was so good I had to post the recipe. I often make risotto in the slow cooker, but it really is not quite like the stir by hand kind. The mascarpone is perfect with the sweet carrots, and the herbs really freshen it up. Unfortunately I forgot the parsley at the store, but it was good anyway. 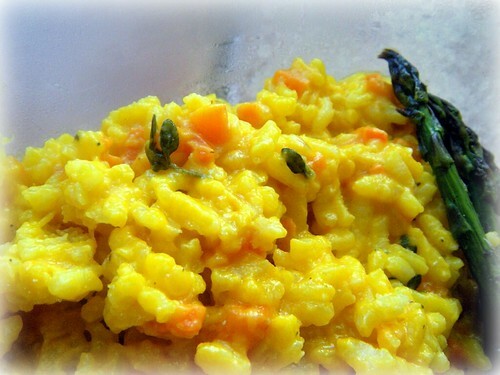 Try this risotto the next time you are looking for a Spring or Summer vegetarian meal. 1. Heat 1 tbsp. oil and 1 tbsp. butter over medium heat in a medium heavy-bottomed pot; add carrots and stir with a wooden spoon until well coated. Add 1/2 cup water, 1/2 tsp. salt, and the sugar; cover and cook 5 minutes, or until tender. Uncover and cook, stirring occasionally, until water evaporates and carrots are just starting to brown, a few minutes more. Reserve half of the carrots. In a blender, purée other half with 3/4 cup hot water. 2. Bring chicken broth to a simmer and keep at a simmer, covered, over low heat. 3. Heat remaining oil and butter over medium heat in same (unwashed) pot used for carrots. Add onion and cook until translucent, about 3 minutes. Add rice, stirring with a wooden spoon to coat rice with oil, 1 minute. Add wine and cook, stirring, until wine evaporates. Add carrot purée and cook, stirring, until mixture no longer looks soupy. 4. Add 1/2 cup hot broth, stirring often, until rice absorbs most of the liquid. Repeat process, adding 1/2 cup broth at a time and stirring often till each addition is absorbed before adding the next, until rice is al dente (about 20 minutes; at least 1 cup broth will remain). 5. Fold in reserved carrots (save 2 tbsp. for garnish), mascarpone, 1/4 cup parmesan, 1 tbsp. parsley, and the thyme. Add up to 1 cup broth (1/4 cup at a time) to loosen the risotto. Season with salt and white pepper to taste. 6. Sprinkle each bowl of risotto with some of remaining 1/2 cup parmesan, remaining 1 tbsp. parsley, and reserved carrots. Serve immediately.